This is a list of commonly asked tech support questions in using the calendar. We hope it will be of some assistance before submitting a tech support ticket. How do I set up recurring classes/multiple dates? Let’s begin with the Time & Date settings for your event. This applies whether you’re converting an existing single event into an event series or creating a new event series from scratch. With recurring events, the first occurrence of your event series will reflect the options chosen for Start/End under this heading. That is the same as creating a single event. Be sure that you’ve specified the correct start date, end date, and start and end times for the first event in your series before proceeding. After making your selections for the first event in your series, you’ll see an Event Series option. This option is located just below the Start/End options for your event. Click the Schedule multiple events button to display the first set of options for your event series. You’ll see a row of buttons denoting the available recurrence types for your event series. For event series that conform to a regular pattern, select the option that applies to your event series (Daily, Weekly, Monthly, or Yearly). If your event occurs on specific dates without following an established pattern, select the Once option for your event. We’ll go over the options for both pattern-based and non-pattern-based recurrences below. A monthly event that always falls on the first Friday of the month. Each of these patterns can be made with Events Calendar PRO’s recurring events features. By contrast, if you set the pattern to end after a certain date, the next logical date will be used as the final date. To extend our previous example, that means setting the pattern to end after October 25 would mean the last date in the pattern would be October 25. In other words, the on and after options let you distinguish between inclusive and exclusive date ranges. Selecting the never option means that events will be created indefinitely as dictated by your Recurrence Settings. 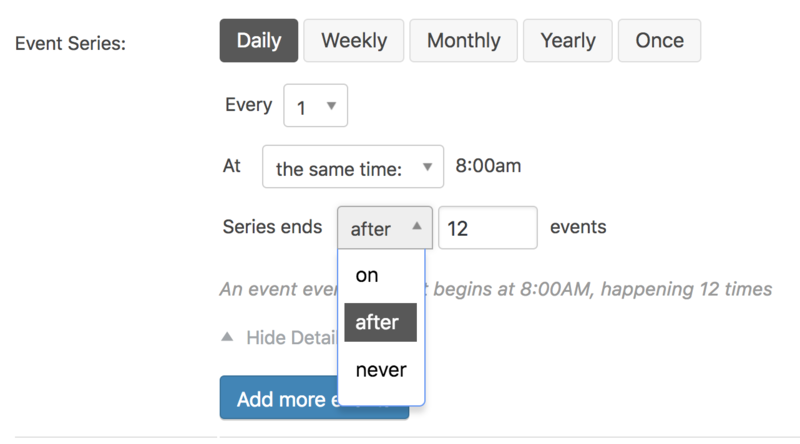 ⚠ It is possible to create a recurring event with no end date for the event to stop recurring. Please note that doing so will set the event to recur indefinitely. This will create an indefinitely growing number of events posts in the calendar. Indefinitely growing events can have a negative effect on the calendar’s performance. Your calendar may load or react slowly based on the number of events that are present in the calendar. If you’re setting up a regular recurrence pattern, such as an event that occurs on a monthly pattern without exceptions, then you are all done! Scroll up until the Publish pane is visible on the right side of the page, then click the blue Publish or Update button to save your event. If you want a more complicated recurring event, read on! And remember, you can set as many recurrence rules as you need. Click the Add more events button once you’re finished with a set of recurrence rules to expand the next set of options. You can remove a set of recurrence rules at any time by clicking the trash can icon to the right of the desired row. You can exclude specific dates or ranges within a recurring series. An Add Exclusion button will appear as soon as you add any other recurrence rules. Clicking this will display a row of buttons matching those that appear when adding a new recurrence rule. You can use the Daily, Weekly, Monthly, or Yearly exclusion options to exclude events in a pattern-based series. You can use the Once exclusion option to exclude a single event on a specific date. Add as many exclusions as you need to fine-tune your event series. You can delete exclusions by clicking the trash can icon to the right of any row. How do I sell class tickets from my calendar listing? IMPORTANT – If you have multiple dates/times – you MUST create each one separately to add the ticket feature. You can NOT use the multiple date / recurring event submission tool as the tickets will only appear on the first listing. How do I add an RSVP to My Listing? How do I edit or delete a class? STEP 3 – Wait for us to approve your account. Can take up to 24 hours. I am a PhiladelphiaDANCE.org Member, why can I not log in? Thank you for being a paid PhiladelphiaDANCE.org Member. You will still need to create a new username/password and account for use of the calendar. This service is separate from membership and completely FREE to the dance community. For existing listings that were transferred from the old helios calendar, the google map may not show up in the interface. All new listings should show maps as they are created. This is an issue we are aware of in transferring of data.